Easily accessible public transportation is provided by Mason and the City of Fairfax. To get around Fairfax, hop on the CUE Bus, which is free with your Mason ID. The CUE Bus provides transportation from Mason to the Vienna/Fairfax-GMU Metro station continuously throughout each day. There are four routes that run in different areas around town. Another free option to get from Mason to the Vienno/Fairfax-GMU Metro station is the Mason-to-Metro shuttle which runs every half hour Monday through Friday and goes directly to the Metro. 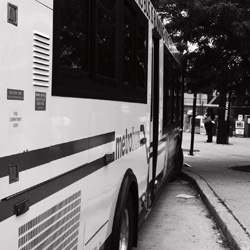 Gunston Go-Bus, a new edition to Mason’s transportation, takes students to particular areas around Fairfax that might not necessarily have easily accesible CUE Bus stops, such as Fair Lakes Shopping Center and Fair Oaks Mall. Whether riding public transportation around town or driving and dealing with parking, it is important to keep safety in mind. Make sure you know the best bus route to your destination and the schedule of buses to avoid missing the last one home. <strong>Check out <a href=”http://orientation.onmason.com/2009/06/18/notable-dc-metro-stops/” target=”_blank”><em>Notable D.C. Metro Stops</em></a> and <a href=”http://orientation.onmason.com/2009/06/18/getting-around-dc-on-the-metro/” target=”_blank”>Getting Around DC on the Metro</em></a>.